Each year Jennifer Rizzo hosts a Holiday House Walk! 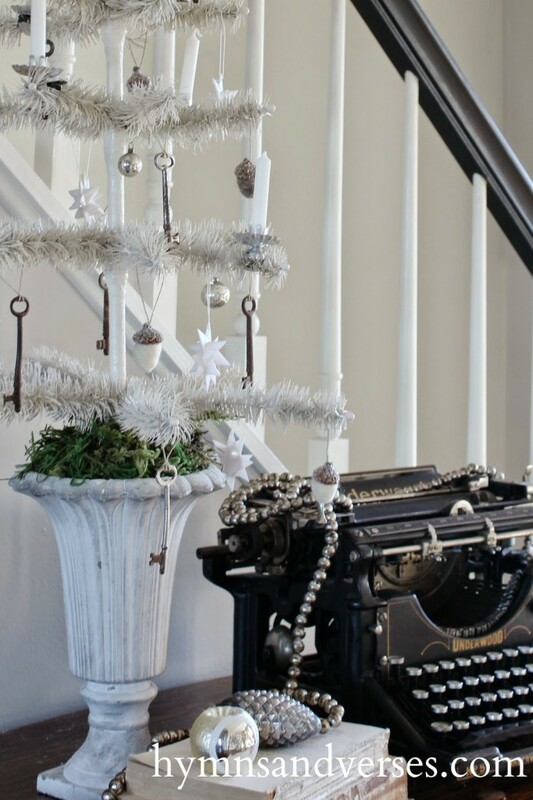 It’s full of gorgeous homes all dressed up for Christmas and is so inspirational! 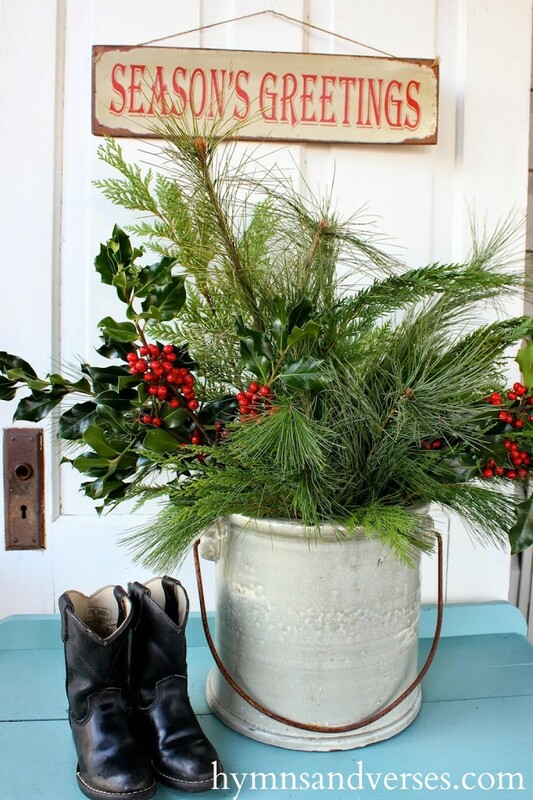 Today, I’m linking up to the Holiday House Walk Link Party. If you missed the House Walk, you can see it HERE. Four weeks post-op and I have most of my home decorated and ready for Christmas. I am so thankful that I have recovered to the point that I can decorate! My surgeon is amazed that I am able to do as much as I am! Thank you, again, for your prayers. I do have a bit more to do and some areas that I am waiting to share later, but for the most part – I’m ready! So, lets get started! 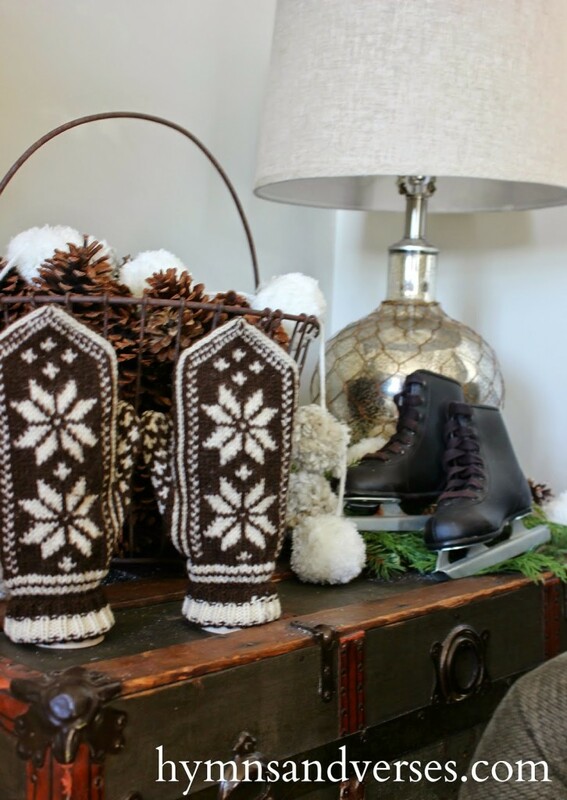 In the living room, I’ve kept things pretty much the same as last season – but moved things around a bit. Here’s our flocked Christmas tree. This year I centered the tree between the two side chairs. The ornaments are pretty much the same as last year! 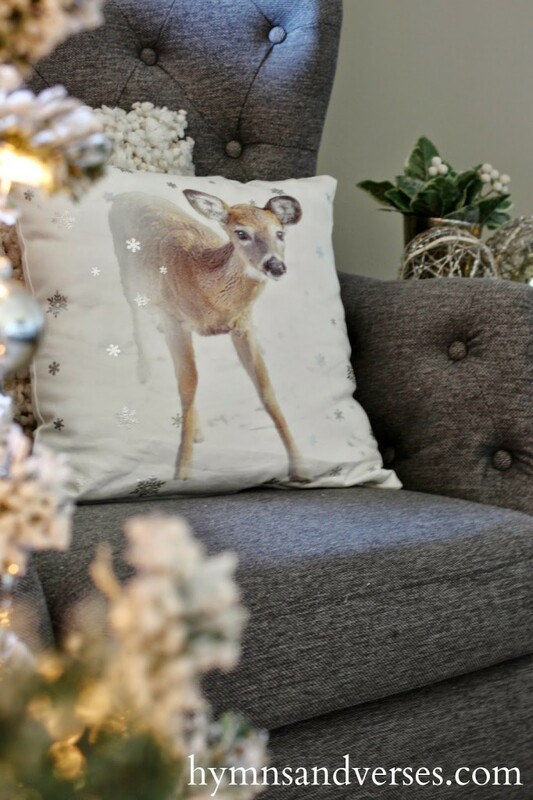 This little fawn pillow is new and it’s from H&M home – yes, you heard right! H&M has a home section on their website and there are some really great items at affordable prices! I found these vintage hand knit mittens at a local antique shop. For display, I put them over some candlesticks so they would stand up. The pom pom garland is one I made last year. If you would like to make your own, you can find the tutorial HERE. I’ve had these old skates for a while now and bring them out every winter season. 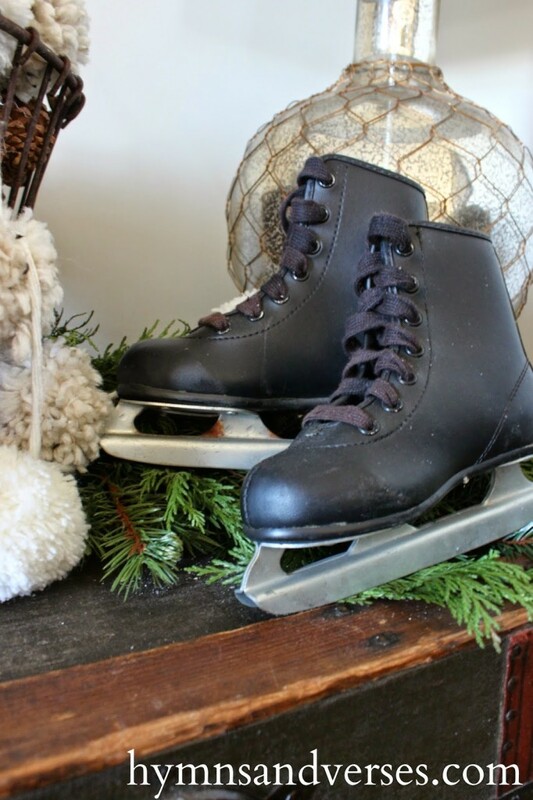 Teeny tiny little feet wore these skates once upon a time! My DIY German glass glitter silhouette nativity is once more on the mantel. This year I decided to leave my mirror in place, but it does make it more of a challenge to get a good photo of the nativity. This year I added a glittered star and banner to the nativity. Several years ago, I became fascinated with German feather trees and decided I was going to make one! I’ve had this one for years, but haven’t used in lately in my decor because it was made from dyed green goose feathers. I have made feather trees with white goose feathers, but had given them to friends as gifts. It’s a pretty intensive project and not one that I wanted to take on this year, so I decided to make my green feather tree white with some spray paint! 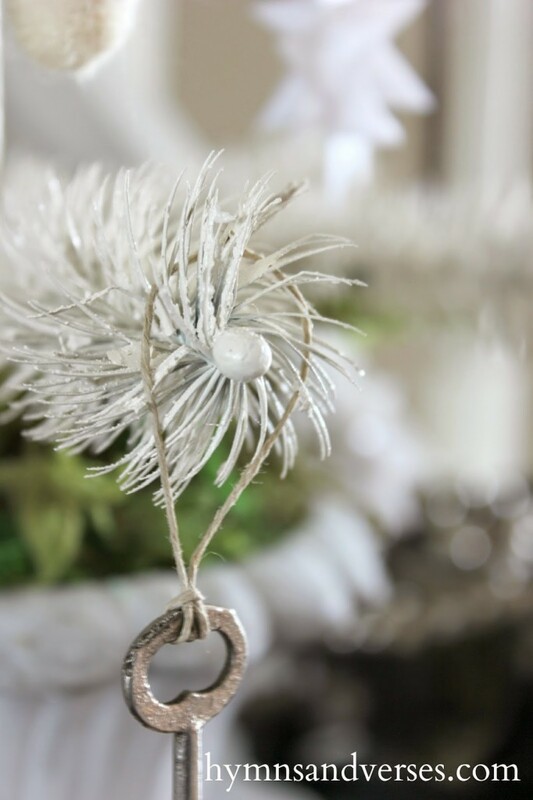 My goal for next year is to make a new white feather tree and show you how to make one too! 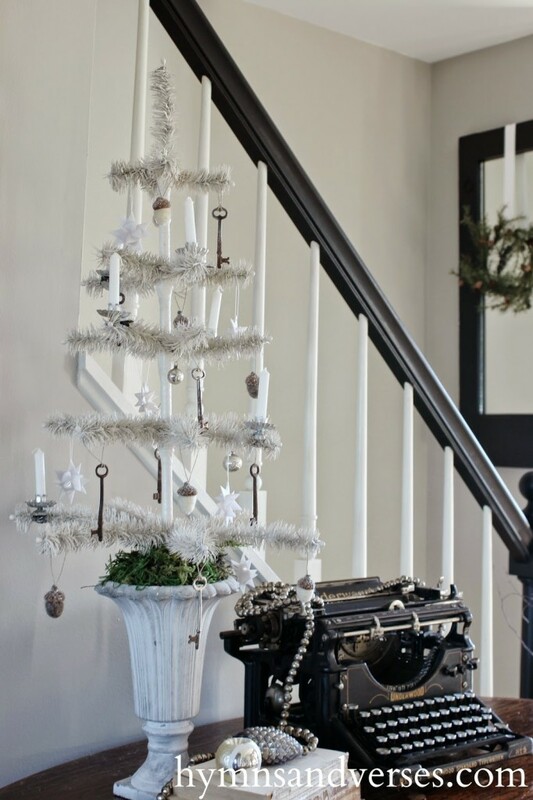 I decorated the feather tree with vintage skeleton keys, felted wool acorns, clip on candles, some tiny, vintage Shiny Brites, and white paper stars. Now lets head into the dining room. Again, I decided to incorporate pops of red into this normally neutral room! Last week I went to a great barn sale and picked up this enamelware tub. Three cypress trees and some apples make it the perfect centerpiece for my casual dining table. 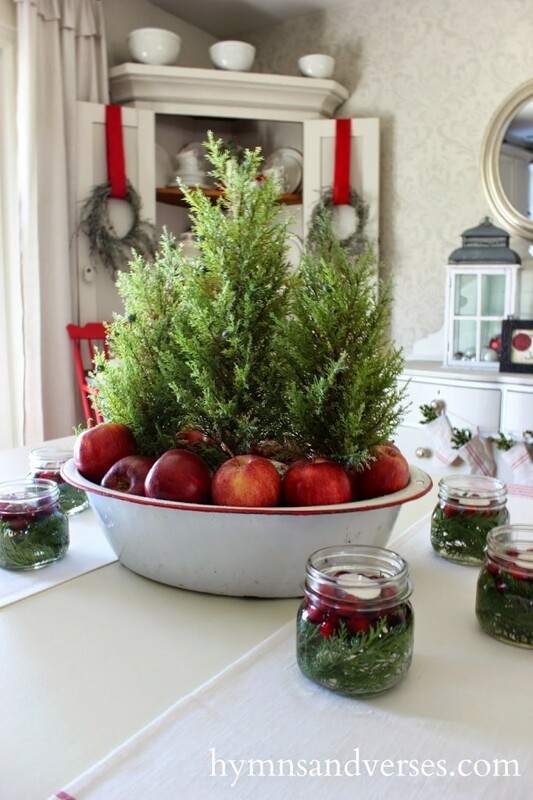 I added some ball jars with cypress stems, cranberries, water, and white votives as accents! Here’s a closer look at the corner cupboard. 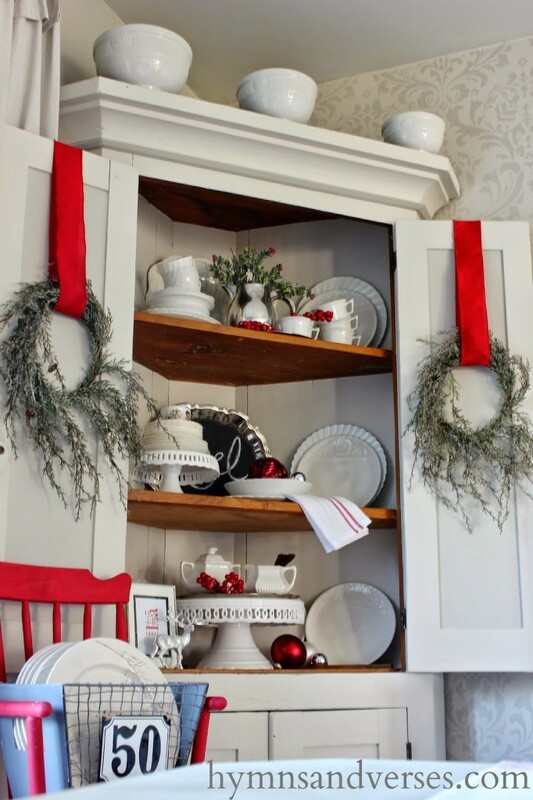 Red ribbon, white ironstone, silver, and greenery is all it took to make the cabinet festive! Did you notice the red high chair! It’s another purchase I made from the barn sale last week! It had chippy white paint, which I liked, but I wanted the chair to POP. I gave it a fresh coat of paint with Miss Mustard Seed Milk Paint in Tricycle. I’ve wanted a set of these mini grain sack stockings from Sutton Place Designs since I saw them on a friend’s blog last Christmas! I was so excited to be able to purchase a set of my own this year! 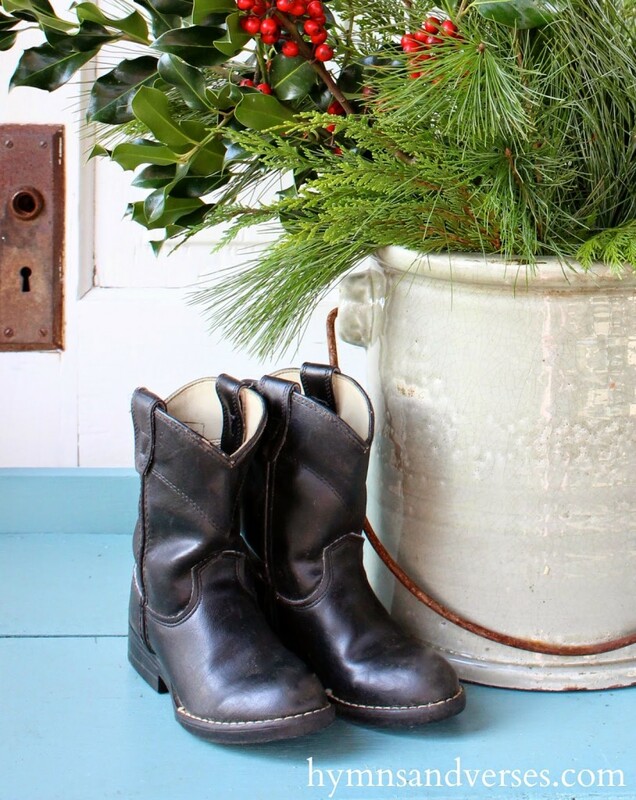 They make the perfect garland tied to some thick baker’s twine. 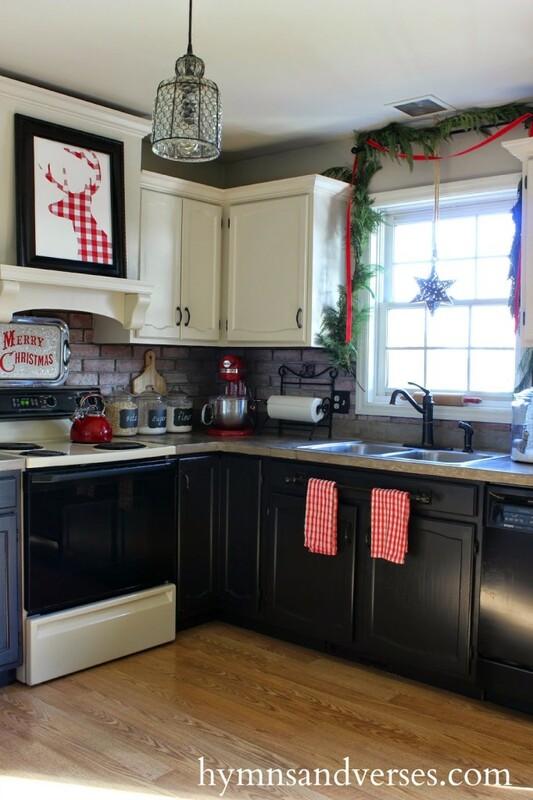 Here’s a look at the kitchen decorated with more red and white! In the kitchen I set up a hot cocoa bar. Everything you need for a cup of hot cocoa is ready and waiting when you come in from the cold. 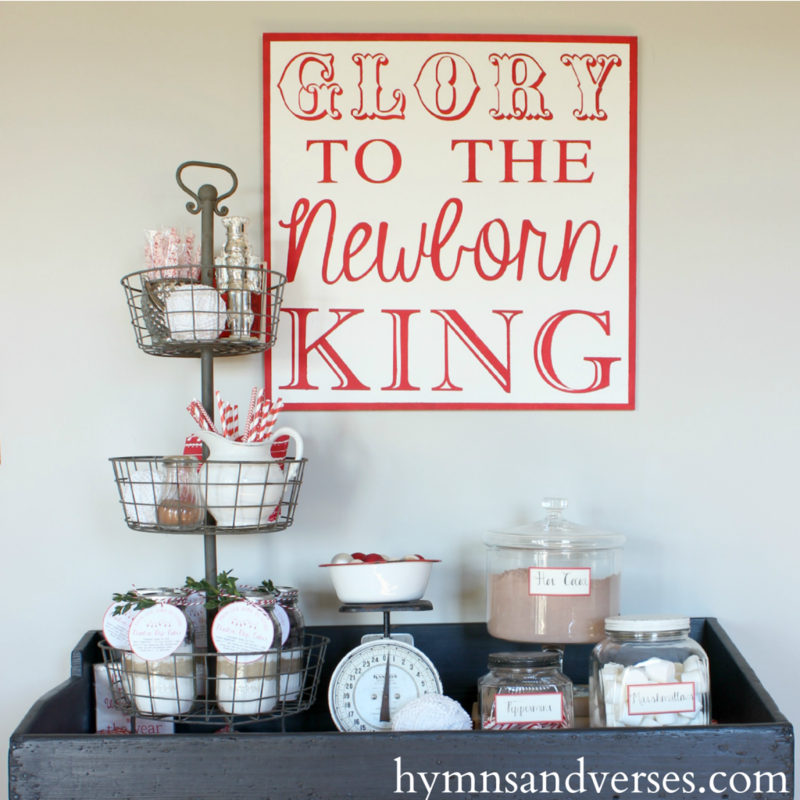 The “Glory to the Newborn King” sign is new and I’ll be selling it in my Etsy shop. 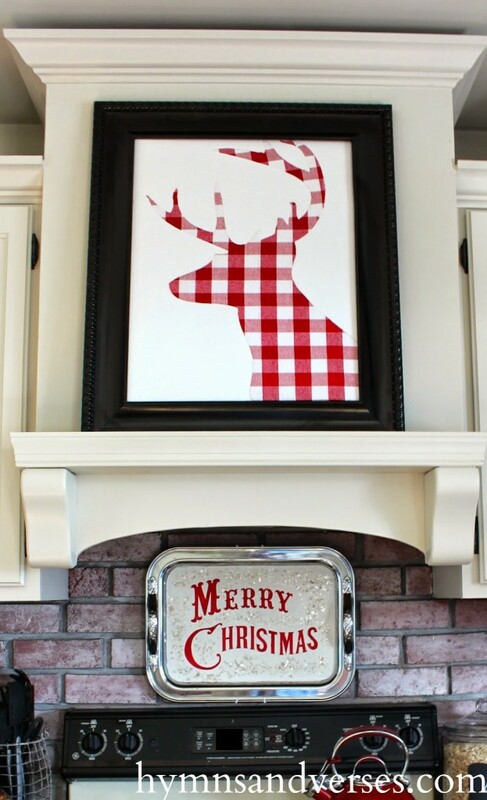 My DIY buffalo check reindeer silhouette art is back on the range hood this year. 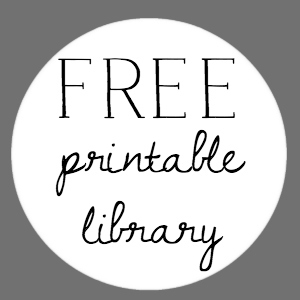 If you’d like to make your own, you can find the tutorial HERE. 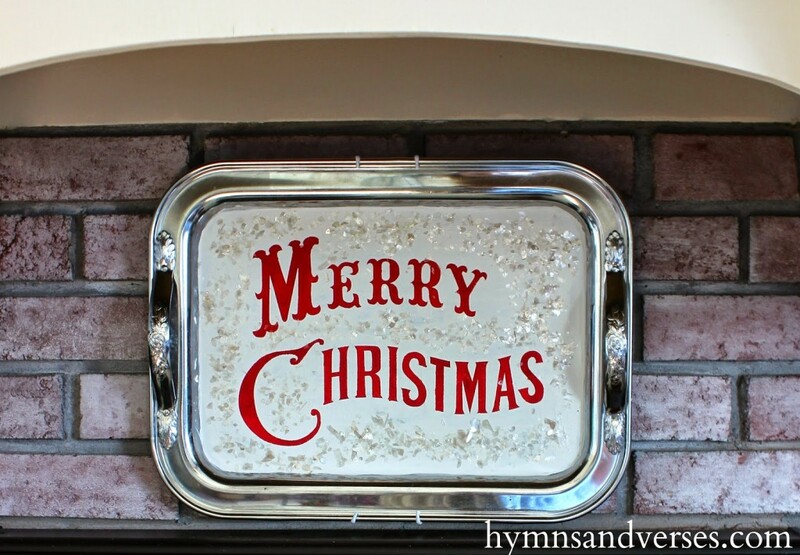 I made this new Merry Christmas sign using a silver serving tray I found at Goodwill. I’ll be sharing a tutorial soon. 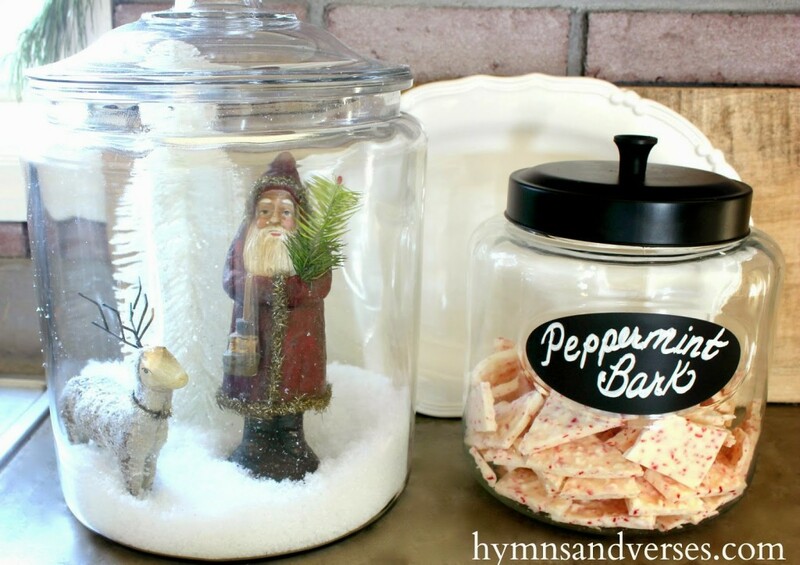 A wood carved Belsnickel and reindeer are in a snowy scene in a large glass storage jar found at Walmart. 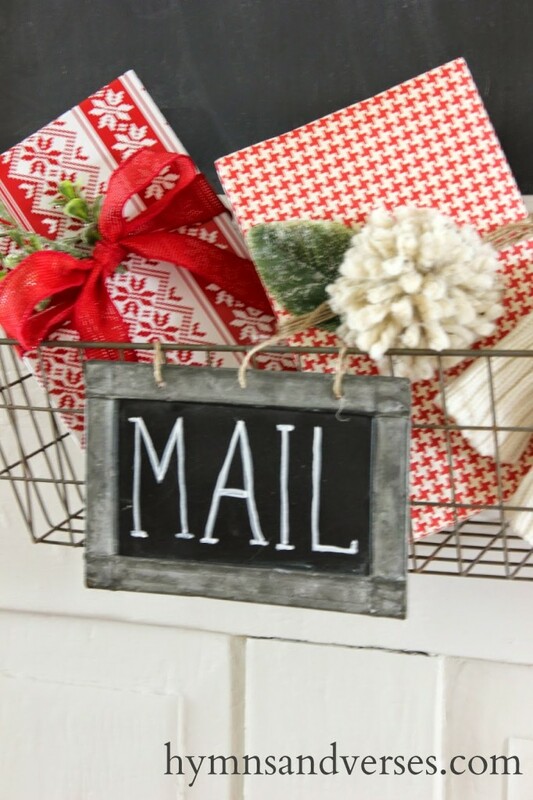 My old door message center gets some festive touches with a wool pom pom wreath and a cozy throw. 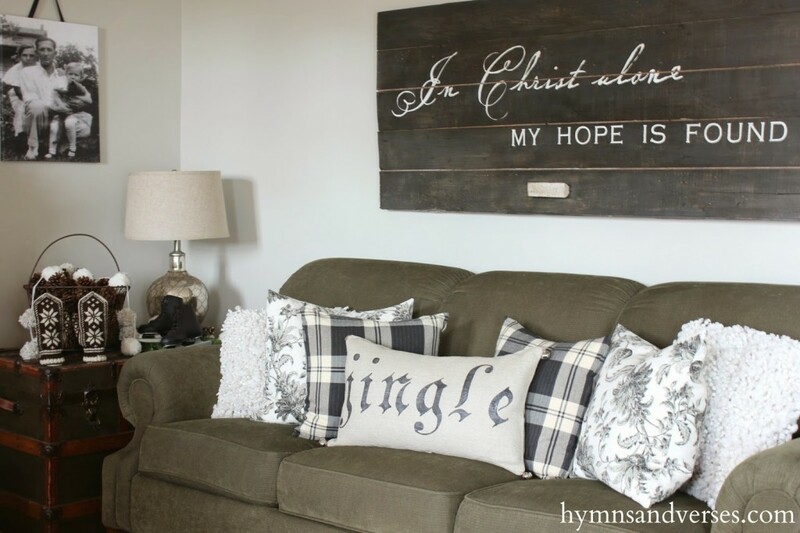 I love this vintage style church announcement board from Mary and Martha. It comes with six different options for sayings – three that are specific to Christmas. I paired it with a set of advent candles in a wooden bowl with some greens. I found the chalkboard tags for the candles this past summer in the dollar bins at Michaels. I had the most fun decorating our bedroom. 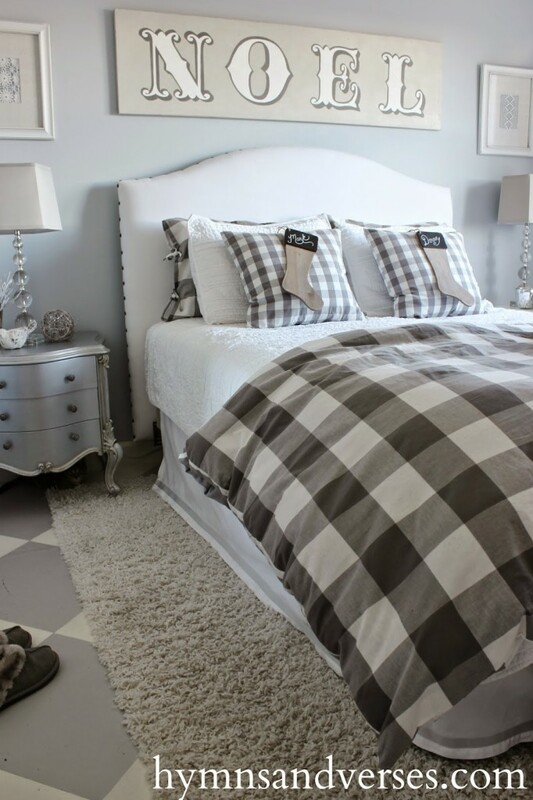 The buffalo check duvet and shams are from Ikea. 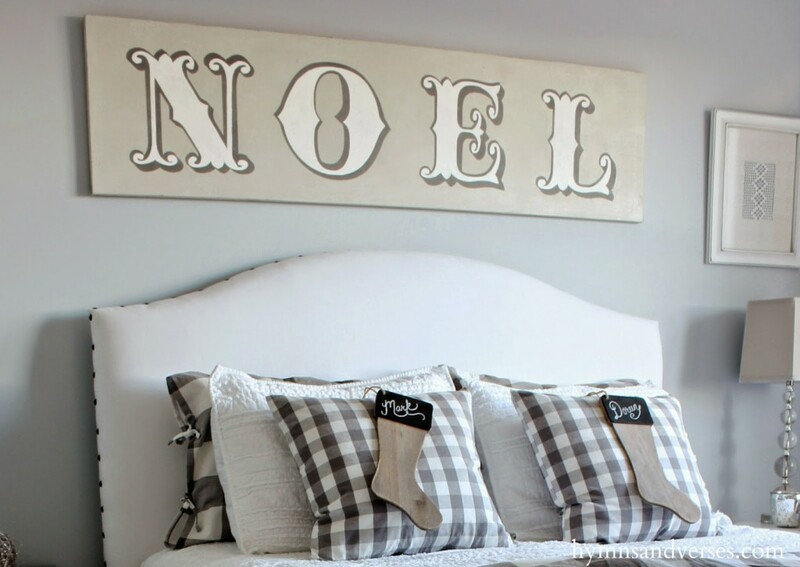 I made the NOEL sign above our headboard. 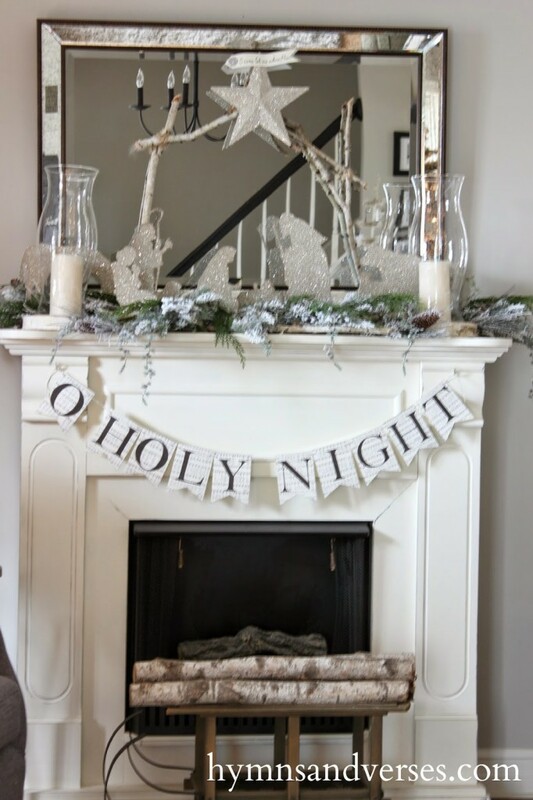 It is fashioned after a vintage Noel sign that my parents used every Christmas. I love how it turned out and I’m sure I’ll use it for many years. 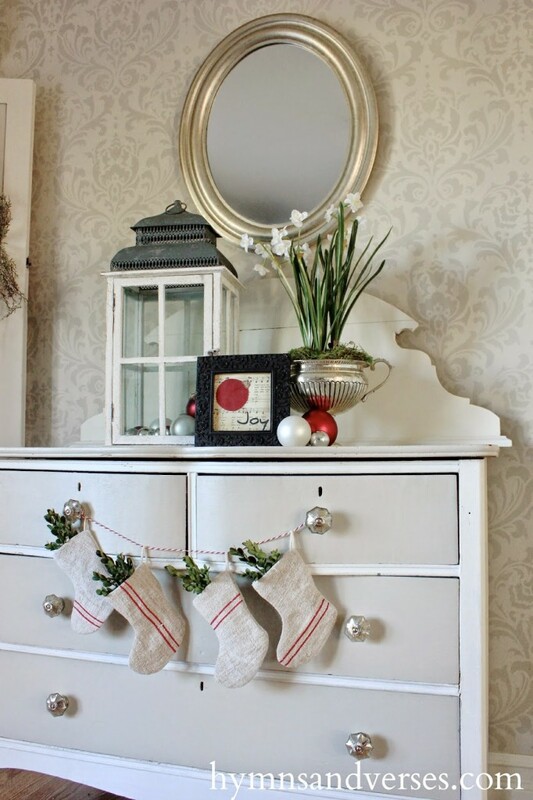 I purchased these wooden chalkboard stockings this year from Finding Home. Miss Sadie had to get in on the action. 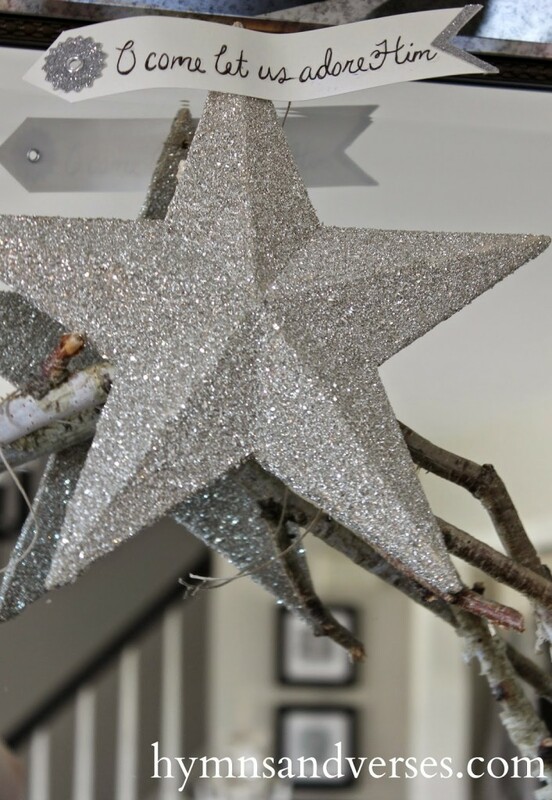 I made the wooden star with lights this year and will share the tutorial with you soon. It’s a quick project with a big impact! Now lets go outside to the screen porch! The tree is filled with handmade and $1 items – DIY yarn balls, gingham mini embroidery hoops, jute rope garland, and more. 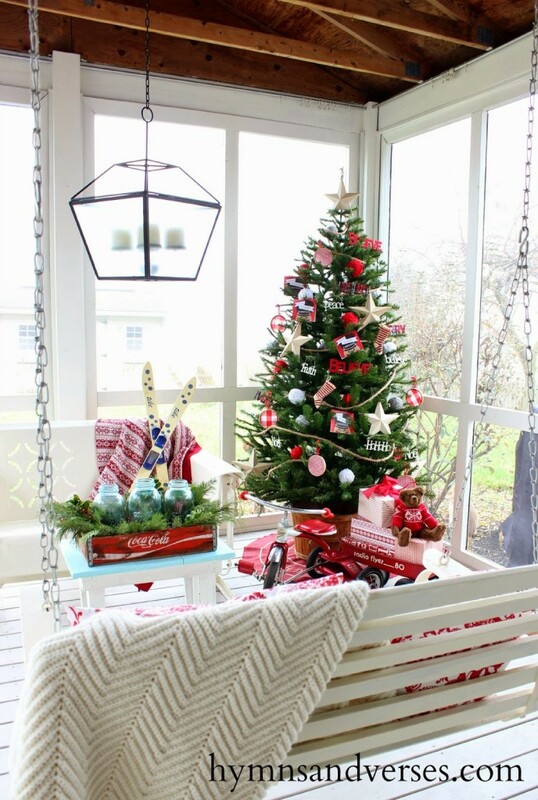 Don’t you just love Christmas red and white – there is lots of it out here on the porch! 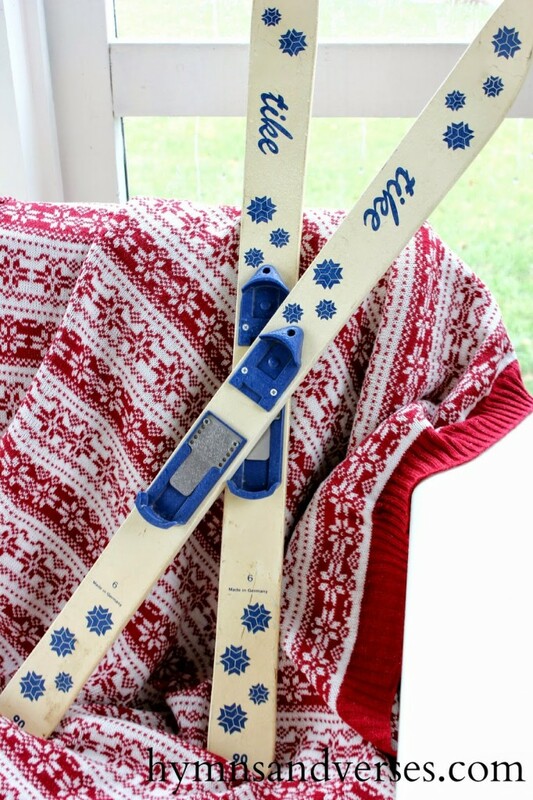 I found these little skis at a barn sale a few weeks ago! 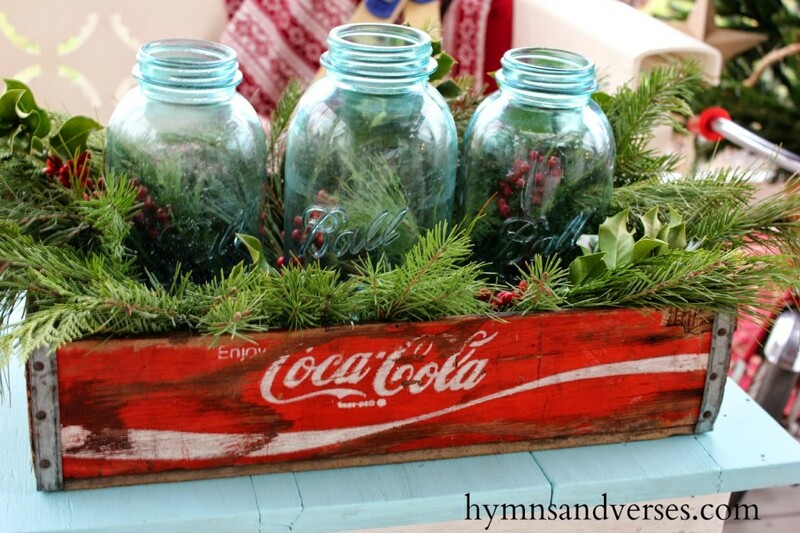 My vintage Coke crate is filled with fresh greens and vintage Ball jars with candles. 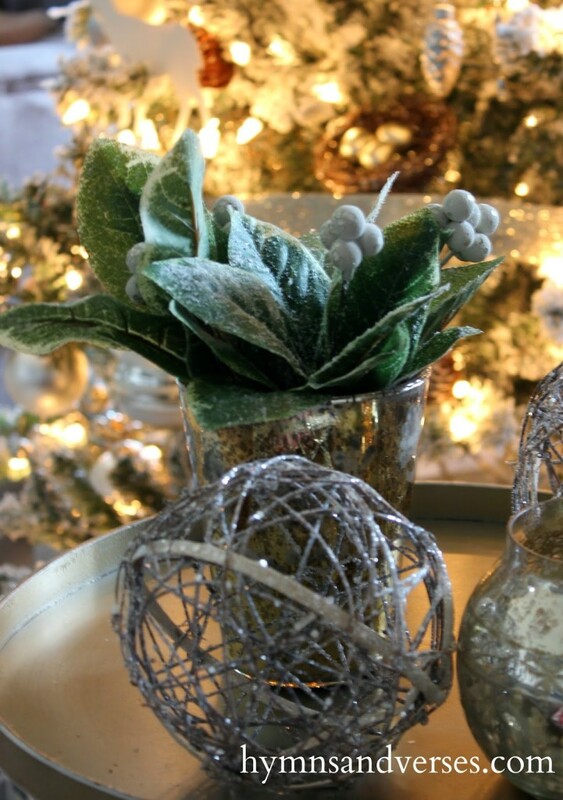 A lot of the decor out here is very similar to what I did last year – I loved it so much, so I just tweaked it a bit! 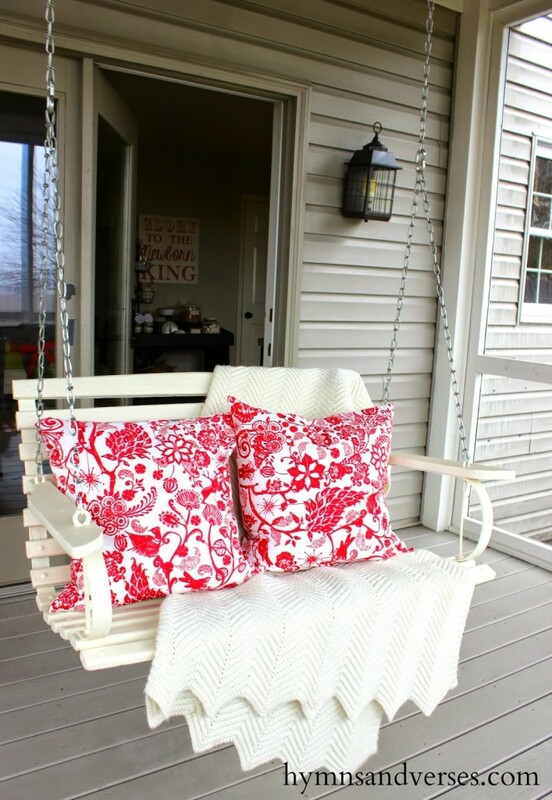 The porch swing is nice and cozy with pillow covers from H&M Home and a hand crocheted blanket. I hope you enjoyed the tour. I’ve saved a few spaces to share with you another day, so be sure to check for my latest post! 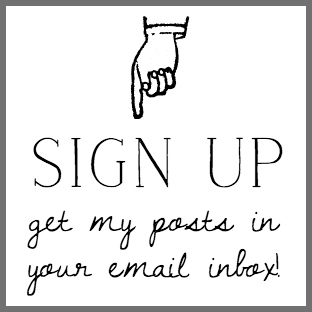 You can make sure you don’t miss a thing by getting my posts delivered to your email. You can sign up at the top of the page or in the sidebar. GORGEOUS…and what a sweet shot of Miss Sadie!! So glad your feeling better! Thanks so much, Martina! Can't wait to stop over and see your gorgeous home! Everything looks so lovely! I love your Christmas style! Also, the church hymn board takes me back!! Doreen, not a day goes by that I don't pray for you. So glad to hear of your good recuperation. 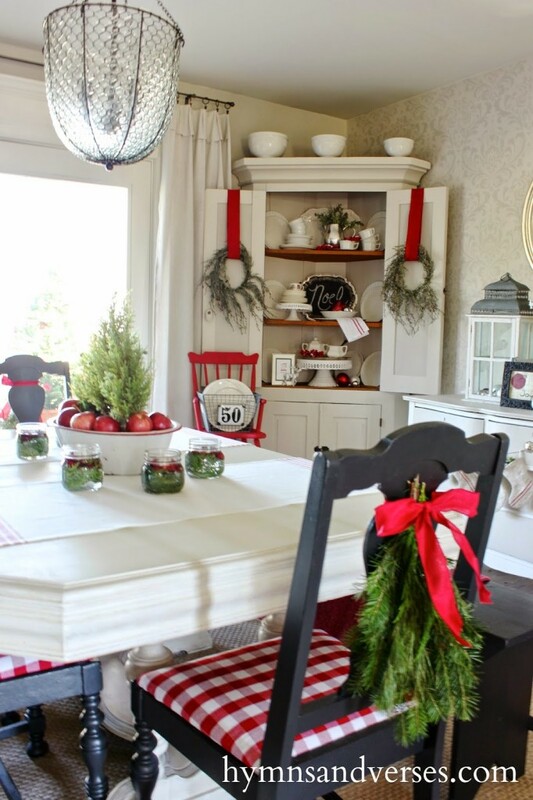 I love the pops of red in your dining room. I love your bedroom. that blue!! The twinkly star! Once again, you nailed it! Thanks, dear friend! You have to stop by and meet Sadie! Beautiful! Thanks for the tour. Oh so beautiful. I love the checks, and your kitchen is totally my favorite. Oh my gosh Doreen! You put me to shame! Here you've had major surgery and your house is beautifully decorated, and I'm not nearly as far along as you! You are one amazing lady and I'm glad to call you a friend. Everything is beautiful but the vintage church announcement sign with the advent candles underneath is my favorite! Pinning and sharing! 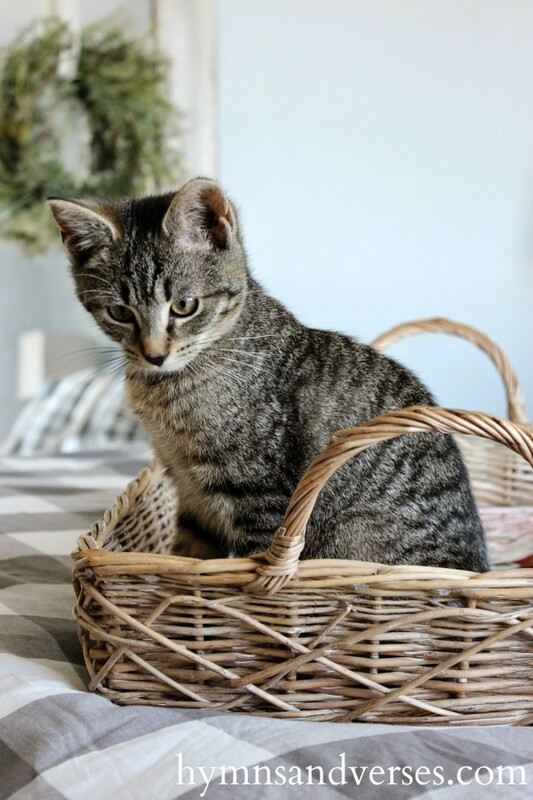 Jane – you are soooo sweet! Thanks so much! Wow, what a beautiful and cozy home you've created! I love every room and every vignette you created! Thanks for the inspiration. I love your home. 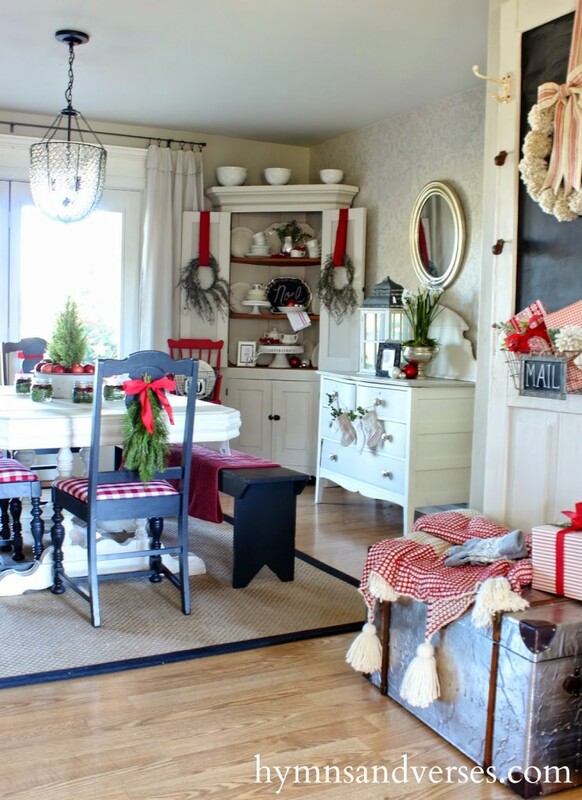 All decorated for the holidays is just stunning! I just want to come spend Christmas there!!!! .. or crawl in the photos at least. It's so charming and inviting and full of Christmas beauty. Gorgeous, just as I expected. You have put me to shame, considering you are 4 week post-op. I love your attention to detail. Just adored it all. Thanks for sharing. Absolutely stunning! Creative and elegant all at the same time. 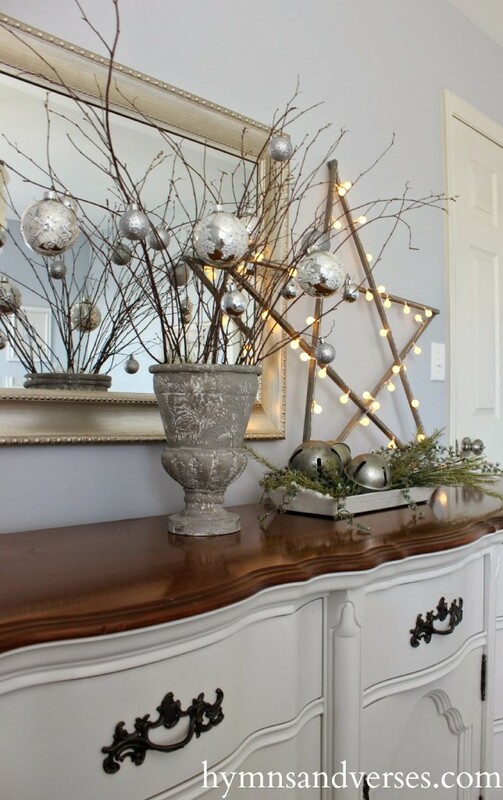 Beautiful holiday touches! Glad you are feeling better, take care. Everything is beautiful and I pinned a couple photos for some inspiration. I absolutely love your vintage, rustic decor. My favorite!! You did a fantastic job! Merry Christmas! So beautiful Doreen. i'm so glad you are on the mend and will be able to enjoy the holiday. everything's gorgeous, Doreen. I'm so glad you're feeling like decorating for Christmas this year. You've made an amazing recovery! So stunning. The best I have seen! 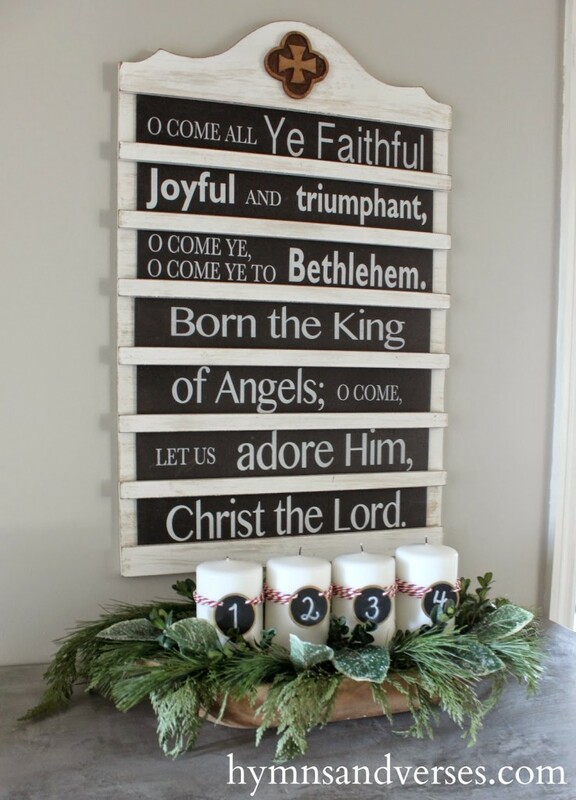 I would love to order an announcement board from Mary and Martha! Please let me know when they are available! And your home is lovely! Your home is so beautiful.. I'm like a bunny with ADD..all over your blog. So many ideas, so little time. I found you on Stone Gable's blog. For now I started following you on Facebook and Pinterest. Will have to visit longer when I have more time to play. Did you make the pom pom wreath? I absolutely love it. Your home looks lovely and so festive. I especially like the old door with mail basket and the cute red highchair with the crate full of dishes. Your hot cocoa bar looks like it will get lots of use this winter. Merry Christmas. I love everything, so pretty. 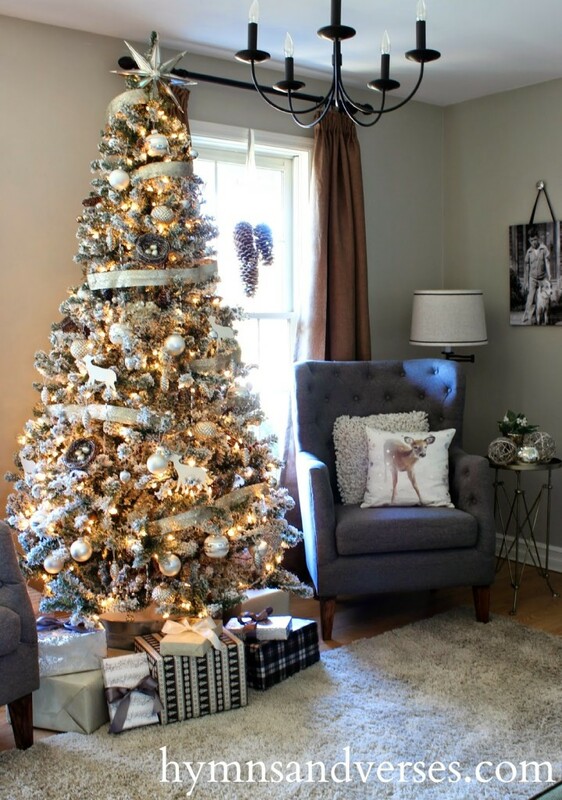 Your tree is stunning and I totally love the way you decorated your kitchen. 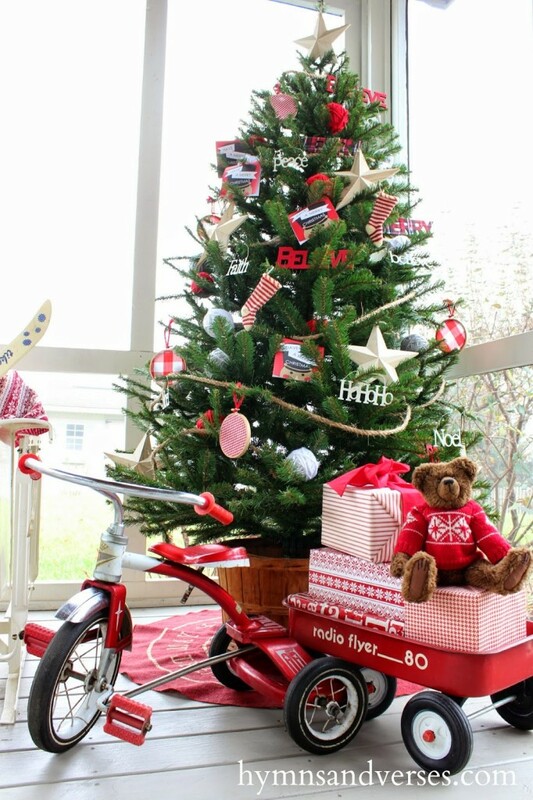 So fun and so festive with so many special touches. Glad you are feeling better. I love it. Everything is so beautiful. I also love that you are feeling well enough to do so much work in making your home so lovely! God ius so wonderfully good. Your home is so, so lovely! Very welcoming and festive! I'm glad you are doing well after surgery, and your kitty is just adorable! Merry Christmas! It all looks so beautiful! I'm so glad you are feeling better! Oh Doreen…I sighed and swooned all the way through this. 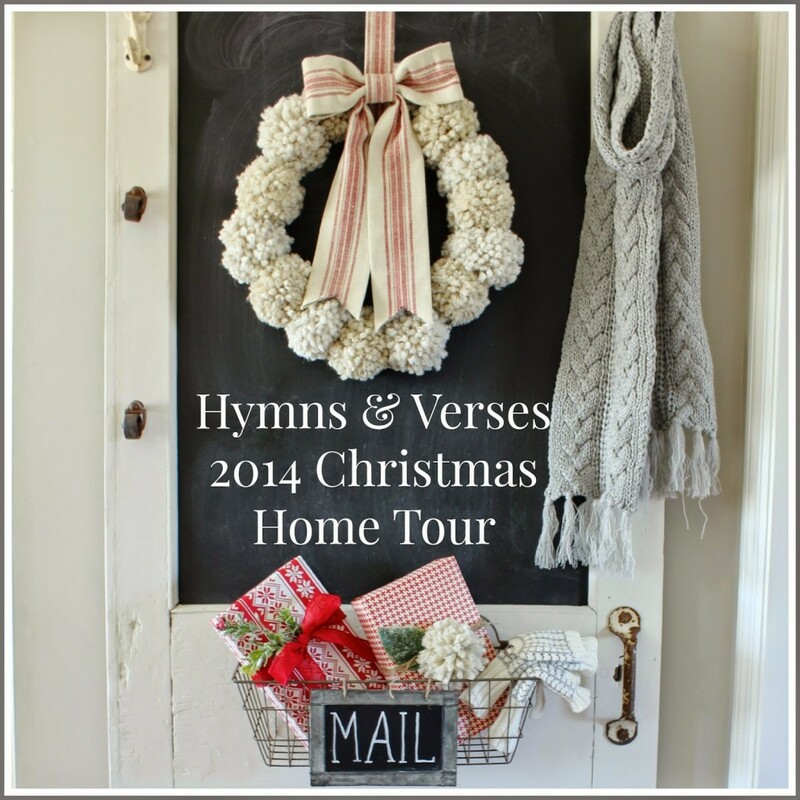 Your Christmas home tour is definitely one of my most favorites this year!!! And the best part is that your love for the Lord shines through in everything. It's all truly stunning! 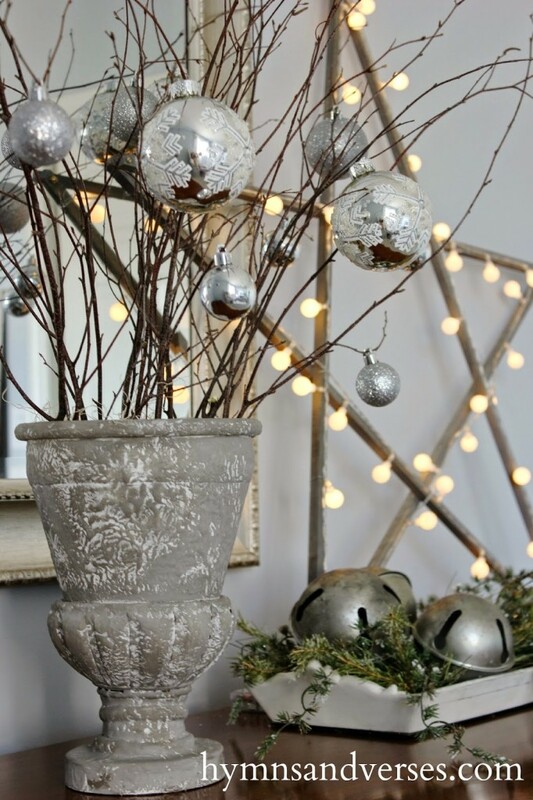 Your home is so pretty and festive, perfect for the holiday season. My favorite room is your dinning room. All that lovely red and white makes me smile! It's so pretty! I really love the pops of red. I am so happy to hear that you are feeling so good. It is amazing you were able to do all of this. Bravo! Your home looks so beautiful! I love all the vintage touches you added! Every single item is absolutely beautiful and so cohesive as a whole! Thank you for allowing us to see your home decorations. Pinned a few images for inspiration! Beautiful! I love the pops of red and your wonderful chalkboard door. I just recently found a door at a farm sale and that is my plan 🙂 love them. God Bless. your chalkboard is fantastic. 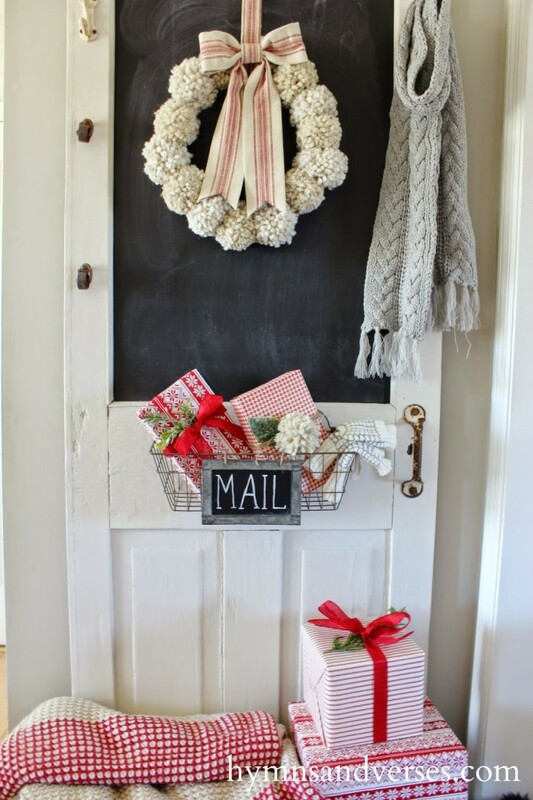 love the idea of the hooks and chalkboard on the door. lovey home, thanks for sharing it with us. Beautiful Christmas tour! I love your chalkboard door–super cute! 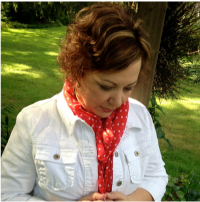 I just found your blog and think it is quite lovely! Love the Mary and Martha stuff too! I don’t know how, but somehow I missed your home tour last year, so I’m catching up now, and pinning like crazy, Doreen! 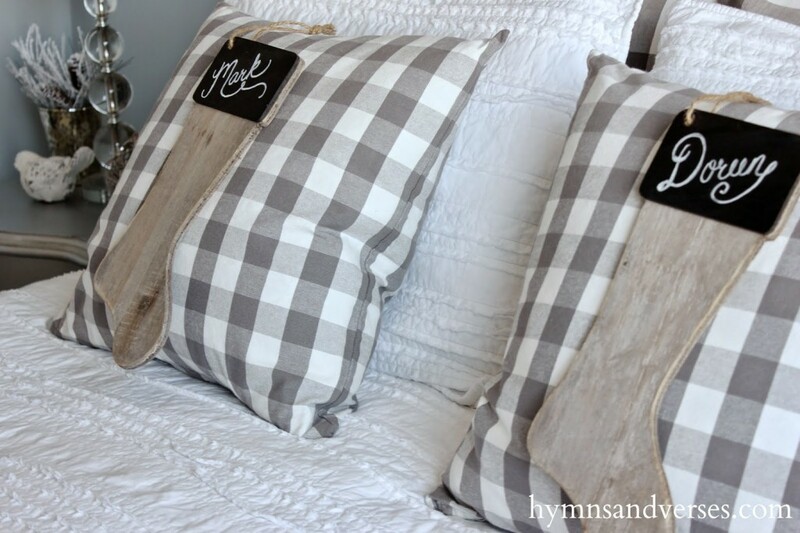 I love all the signs you’ve made for your home – especially the ones over the bed. I like both the Noel and the love sign made with rope. I want to try doing a rope word using our last name for the living room. Thanks for sharing your expertise with us amateurs! Loved the Christmas tour! You feel the season (and the ‘reason for the season’) without being over done. You can still walk through the house without bumping into stuff.